Ivy, I just received the best surprise in the mail today!! Not just one battery cover, but a whole rainbow of colors! Thank you so much! It’s so nice to not have a sticky bandaid behind my ear! This is to let you know that I have received the Cochlear Mini Microphone. It is currently plugged into my computer where I am able to stream my online class videos. This is just great! Thank you and CIAF for sending this important equipment to me. I am most appreciative. Also thank you for being so quick to respond to my request. Me and Manny want to thank you and foundation for everything from our hearts. You folks are so kind. We and other family members are putting together a nice Donation for your Foundation for the Holidays. Thank You - Thank you -Thank you CIAF®!! I have everything I need now to be back "wired for sound" and resume my life as a New Nana!!! I will be forever thankful and grateful that I can hear once again thanks to your organization! Thank you very much for the two BAHA intensos. I received them yesterday. They work perfect and are of tremendous help to me. These units are a blessing for me and I thank you so much for what you do!! I was thrilled when I got them. Good morning we would like to thank you from the bottom of our hearts for helping with Gianni's Cochlear Unit. It is working great. I also have a call into Shelly at All Children's Hospital to see if they can bill medicate. Shelly said she'll try her best. But there still having issues between the insurance still. Also we will call in each month to see if an upgrade is available. Since your the only one help us. Have a wonderful day and a great weekend. Thank you so much for helping my Mom, Linnea Phelps, by sending the ESpirit3g units to the U of M Audiology. They got them programed and sent to my Mom. I put one on her last night and it worked!!! She could hear again! As I mentioned before she is 89 and has dementia so this has been so confusing for her. We will be mailing a donation into CIAF today. I just want to thank you for the incredible help you have given me with the 3G processor. My audiologist sent them to me and I am using one today and can hear clearer than I have heard in a very long time! Your assistance has added to my life and I thank you for that. Thanks so much . You have been a lifesaver for me. I am already using one of the devices and I am waiting for my audiologist to ship the other two. I really appreciate your good work. We just got a call from Michael's audiologist. He is holding a brand new processor for him!!! Thank you SO VERY MUCH for making this possible!!! We are beyond grateful!!! Thank you so much to your foundation for sending my son some cochlear implant batteries. With the help of family, we were able to collect enough money to get him one battery for his birthday so he could hear again. Your package of rechargeable batteries came the same day. He said it was the best birthday ever. We would like to thank you for all your help in providing my husband with his upgraded cochlear implant system. He was very excited to receive it and has been blown away by the sound quality and the system itself. Once again we would like to say thank you to you and the foundation. With out your support, I don't think this would have been possible. Just letting you know that I received my Baha's in the mail today!! I only had batteries that would fit the bp 110 power and it works wonderfully. I can hear things I haven't hears in over 15 years. Just this one 110 works so much better that my intensos ever did. I was freaking out that it sounded like it was raining outside an all it is is the fan on my laptop. I never knew it even made a sound.... lol....I cried I was so happy. Thank you so much!! Words cannot describe how much I appreciate what you and that foundation were able to do for me. I live in a very small town so I will have to wait till I can get to Walmart to get other batteries I need for the 2 bp 100's. I will let you know if they work or not. Again, thank you and have a wonderful day! Just wanted to let you know that both N6's were mapped yesterday. The sound is sharper and louder. It's been an amazingly smooth transition. Sometime next week I will be sending you both Freedoms with all of my accessories. While at Listen For Life my audiologist noticed a small hairline crack in one of the freedom controllers. Which took me by surprise I have no idea when that happened! Luckily it's still under warranty until March 24th. Cochlear is sending me a new freedom controller under my warranty. It should arrive Monday. Shortly afterwards I'll be sending my freedom kit to you. We are on the road headed back home. Lee's appointment went well. He is super pumped to have newer technology! He is familiarizing himself with the remote and the personal audio cables w/ his iPad as we travel. We wish to send a ginormous THANK YOU to CIAF® and District23! We could not have done this without your help. We will keep you in the know as to how he does with his new n5's. Right now he is walking on cloud nine!!!!!!! Our hearts are filled with gratitude for your contribution to my hearing journey. I have been bilateral for 10 years with Freedom processors from Cochlear. These processors changed my entire life on so many areas that it is impossible to list them all. Hearing my grandchildren, music and the sound of rain was life changing. I discovered I do not like the sound of clocks but love the sound of the ocean waves and birds. I can not imagine going back to a silent world after 10 years of hearing. When Cochlear announced the “end of life” for my Freedoms, I was very fearful that the end of my hearing journey was coming to pass. There was no way we could afford the newest N6 processors. We had to close our business a few years ago after 23 years. It has been a challenge to get back on our feet. We knew obtaining new processors would be a hardship for us. The insecurity of never knowing how long my Freedoms would last would be a continued fear. We decided to pray that God would lead us in the right direction and to exhaust all avenues of financial help. Every door, every email, every phone call made turned into a dead end. Our hope was ebbing until we discovered your CIAF® website. We had not known such a company as yours existed. It became a quest of hope and believing that God would provide. When we connected with you Michelle, you made an offer to help our situation which was such a blessing. We could hardly believe our ears. You were willing to help us obtain a new N6 if we purchased one ourselves. In fact, John had you repeat the offer because it was such a gift, he could hardly believe it. We then tried to secure financing for the N6 we were purchasing ourselves. Then you informed us that you had gone to bat and presented my case to the Cochlear. Some how you amazingly convinced Cochlear to match your donation allowing me to receive not one but two donated N6’s. This has given me the security to carry on my with my hearing journey. We are so incredibly thankful for you, Ivy and your team in securing these N6’s for me. We both appreciate all the work and effort you and your team put forth in making this a reality. Thank you for your time and all of your effort-you have NO idea how amazing this is. We have worked and worked and trying to find batteries and NOBODY was willing or able to provide help. Thank You so very much You are a godsend. I can't thank you enough for the processor and batteries that you sent to my son, Grant. We went and picked it up and it works beautifully! Receiving this gift of hearing for him is something that we cherish and words alone can not tell you how grateful we are. This foundation that you set up has truly been a blessing to Grant and myself, as our health insurance does not cover a single penny of his cochlear implant supplies. Reading your email about what you were able to provide to Grant brought real tears of happiness to me. To see Grant's smile on his face after reading your email was a moment I will never forget! Thank you so much for the awareness that you are bringing to the world around us. What an amazing person you are that started such an incredible foundation. 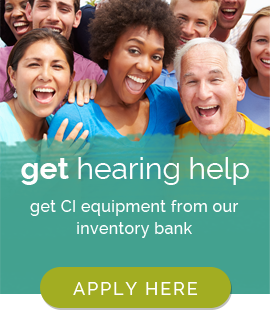 I am so thankful for Allison at Cochlear Corp. suggesting that I contact CIAF® when I lost my cochlear implant last weekend. You worked with me on the weekend (in 24 emails back and forth) validating my application. Tuesday, after talking with my audiologist, you sent a replacement Freedom via Fed Ex overnight. Friday my audiologist will remap the new unit and I will be able to catch up with all that I have missed during the week. I read lips very well but after 20 years of renewed hearing due to the Cochlear Corp.’s products I found the absolute silence a bit unnerving. Thank for helping me, Michelle. I see Heather struggle with her hearing loss on a daily basis. With her cochlear implant, she was able to utilize hearing to communicate with her 3 children and be alerted to sounds most of us take for granted. Her apartment had never been equipped with assistive devices for the deaf, so the processor is a necessary item for her communication and safety. After consistent use of the processor, a malfunction of the coil and cable took away any chance of her hearing a single sound, environmental or otherwise. Although she has Medicaid, we had been unable to find a doctor willing to front the cost of the replacement equipment, as the sole manufacturer of her components does not accept Florida Medicaid. As a child with a profound hearing loss, there were several resources for support of her various needs--unfortunately, as a young deaf adult, there are not. As an advocate for this single mother of three children living on a very low fixed income, I was thrilled to learn of your agency in the hopes of the assistance needed to get her implant functioning again. I send my deepest thanks for what you are doing and I hope there's a way I can help in your endeavors! Thank you so much for your help. I will surprise Deric when I get the batteries. I'm looking forward to receiving the package. It's a blessing to have people like you that find it in your heart to help. When the working condition of my speech processor began to rapidly decline, I feared that I would go deaf once again. As a chef, I rely on my hearing through the use of my Cochlear, not only to perform my job with efficiency, but to evade the dangers that come with working in a busy kitchen. I had no health insurance and was unable to afford the purchase of a new processor. The Cochlear Implant Awareness Foundation® gifted me with a new processor so that I would not have to go through the ordeal of losing my hearing and and my ability to work. It was gift that brought tears to my eyes. I will never be able to repay what the gift and kindness that Michelle Tjelmeland and CIAF® provided me. My only hope is that others in similar situations as I, will continue to be able to benefit from such a wonderful foundation. Thank you so much for everything you have done for me, Michelle. You have no idea how indebted I am to you and CIAF®. You truly showed me that there are still people in the world who are committed to selflessly helping others in their times of need, and may you continue to do so for many other people. I want you to know that I will be making contributions to the Cochlear Implant Awareness Foundation® whenever I can, to ensure that others can benefit the way I have. Ava was born profoundly deaf in 2004. She received bilateral cochlear implants in 2005, and 6 months later we found out the internal pieces of the implants were recalled due to an unknown defect. We chose to leave them in place while completing regular testing to ensure their effectiveness. Around age 4 it became apparent the implants were no longer as useful as they should be, so we re-implanted Ava. While this was going on, at 18 months, Ava was additionally diagnosed with Cerebral Palsy. She wasn’t walking yet and not progressing in her speech. The CP was affecting her legs as well as the muscles in her face. Her eyes would cross and she wasn’t chewing solid food. Many years of intense therapy, minor surgical procedures, and 1 major surgery on both legs would follow, allowing Ava the opportunity to speak as clearly as she can, acquire terrific listening skills opening her world up to language, and walk by herself unaided. Fast forward to age 9. She has been in Speech Therapy since she was 4 months old and Physical Therapy started around 6 months. There are certain nuances that go along with having Special Needs. Socially, Ava struggles to be understood because her facial muscles simply don’t work properly. She is unable to chew with her mouth closed, her eyes still cross without glasses, and she is unable to keep up with “normal” kids. In continuing to provide Ava with opportunities to meet other kids like her, we started looking for summer camps for kids with Special Needs. We came across Adams Camp, which has therapists and counselors to help kiddos with many issues. However, Ava is much more independent and mobile than many of those kids, and we saw that Adams Camp offers and “Adventure Camp” for special needs kids who are mobile and more independent. The cost of the camp was more than we could afford so we started looking for scholarship opportunities. 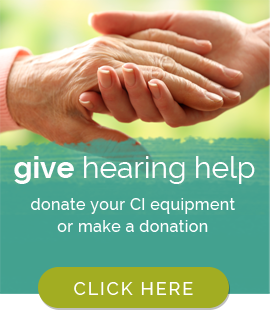 Enter The Cochlear Implant Awareness Foundation®! I contacted Michelle Tjelmeland and asked if there were any opportunities for her to help us. Upon reviewing our application Michelle called me and said, “We want to send Ava to Adventure Camp!” WOW! What an amazing blessing for Ava! We are so excited for her first camp experience and the first time she will be away from home for more than one night by herself. We can’t wait to hear all about her adventures! Thank you, Michelle. Thank you CIAF®, for making Ava’s dreams come true! Thank you so much for your help in providing my daughter, Monique, with a new cord/coil for her Esprit 3G. Parts for this processor are no longer available and we were distraught when we were informed of this. If my daughter could not get this part, she would not be able to hear...it's that simple. I cannot thank you enough for enabling my daughter to continue to enjoy the gift of sound!